Acoustic therapy. Sounds are used to cover up, or mask, the tinnitus. This distracts your brain and helps you “tune out” the ringing in your ears. Electronic devices that produce white noise, air conditioners, fans, soft music, etc. can all be employed. Tinnitus retraining therapy. Similar in concept to acoustic therapy, tinnitus retraining therapy utilizes a portable sound generator that produces soft patterned tones to help desensitize the brain to the sounds of tinnitus. Steroid Injections. Meniere’s disease (also known as endolympatic hydrops) has a triad of symptoms (hearing loss, tinnitus, vertigo) that fluctuate due to increased fluid pressures in the ear organs. Fluctuation of hearing and resulting tinnitus can be treated with a series of injections of Dexamethasone (a potent steroid) with an 85 percent chance of reduction in tinnitus symptoms. Surgery. If you have an acoustic neuroma and suffer from tinnitus, the tinnitus may be resolved through a surgical removal of the acoustic neuroma. In a 1981 research study of more than 400 patients, 45 percent improved their tinnitus with the surgical removal of the acoustic neuroma. Counseling. Counseling, sleep and cognitive behavioral or relaxation methods can be practical in helping you manage your tinnitus symptoms by reducing the stress, anxiety and sleeplessness that are often associated with tinnitus. 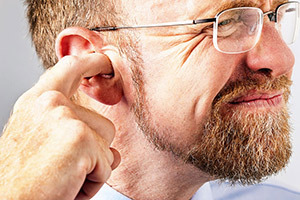 Great Lakes ENT Specialists providers teach methods to help you manage your tinnitus symptoms.